Experience a new firework ambiance in your home with these LED Firework Lights. Made with high grade copper wire they are strong yet flexible, bend into any shape to match any decor inside or outside your home. 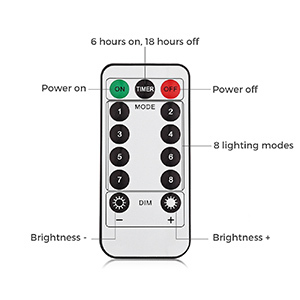 REMOTE CONTROLLED - Wireless remote control, effective receiving range is 10 meters. So you can control the rope lights remotely with 10 brightness levels and 8 different modes (steady/blinking/flash/smooth/strobe, etc), can create vibrant dynamic atmospheres. EASY TO SHAPE - Made of high-quality flexible copper wires, so you can easily mold into any shape or form matching your requirements. INDOOR OR OUTDOOR - Perfect use of outdoor, patio, garden, plants or wedding events. Indoor applications would include Christmas trees, Marquee, Kitchen, Living-room, Bedroom plus many more. ENERGY EFFICIENT - No pollution, a cold light source with low-energy consumption and it will never overheat. WATERPROOF - The bulbs and the light strings are IP67 waterproof grade. The battery box is waterproof grade is IP65. Winter is coming! You may need a special light to bright and decorate your space, make your festival and space bright, beautiful and warm. Then this starbrust light would be the best choice! You can DIY any shape you want for decorating your spaces, like place it into your vase, hang on the ceiling or any way you want. 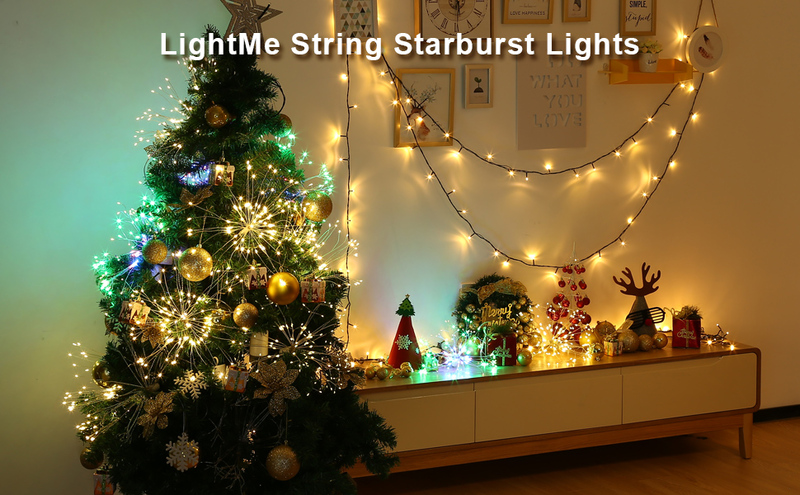 The starburst string light`s pure copper cable is flexible and easy to shape, such as 'firework', 'bouquet' and 'chandelier'. Use your imagination and creativity to decorate anywhere you want. 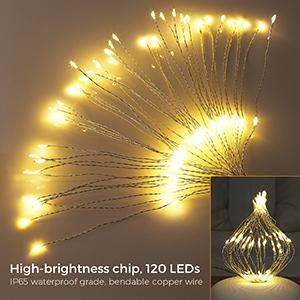 120pcs quality LEDs are distributed evenly on the 60pcs copper strings, ensuring the 360-degree illumination, brighter and more brilliant to make any interior space splendid and beautiful. Warm white light can bring you warm atmosphere without harm for your eyes. Using no pollution light source with low energy consumption, the LEDs will not overheat.